Universal Orlando Resort™ vacations just got extra affordable. This brand new hotel, the first in our Value category, has the lowest rates of any Universal hotel. 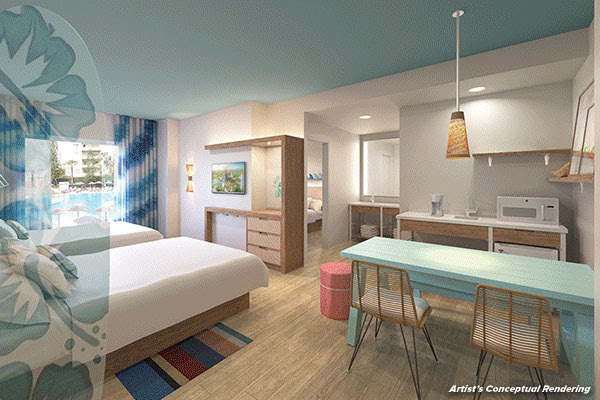 In addition to standard rooms, Surfside Inn and Suites will feature spacious, two-bedroom suites that sleep six, making it the perfect spot for families of any size to experience Universal Orlando™. 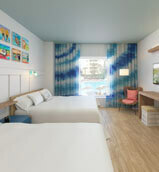 All suites and rooms are bright and surf-themed. As with all other Universal Orlando hotels, guests will enjoy exclusive benefits like being able to breeze into the parks an hour before other guests* and more. With complimentary transportation, it’s a quick hop between the parks and the hotel. Surfside Inn and Suites will open in Summer 2019. A sister hotel, Dockside Inn and Suites, will open in 2020. 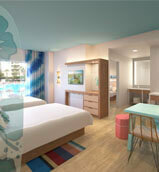 Both hotels will be part of Universal’s Endless Summer Resort, a vibrant and sunny retreat. Surfside Inn and Suites favors comfort over fuss. Guests will find this free-spirited attitude everywhere, even in their dining options. There’s a food court with a variety of stations serving three meals a day; a pool bar will offer frozen drinks, cocktails, wine and beer; there’s a coffee bar in the lobby and pizza delivery to rooms.